As you arrive home after a long day of work, make sure your home welcomes you with open arms. Let these 8 lovely living room settings inspire you for your home's makeover. Don't fear color - and try something that shows off your personality. Your living room is often the best area for the perfect 'designer look' that fits you. Custom upholstery is a great choice for these areas. By taking advantage of the designer fabric options and intricate detailing, you can create a sofa, sectional, chair, or ottoman that injects the perfect mood into your living room. This room's soft neutrals paired with metallic hues are a great base to let the jewel tones of the chair, ottoman, and pillows 'pop'. A great use of space, this living room also showcases collectibles and heirlooms on a beautiful bookshelf and has a small writing desk with extra seating. Quickly becoming this year's favorite colors by homeowners, peacock blues, chartreuse greens, and brilliant navy blues are all over...and we love it! Another trend this season in custom upholstery is the use of patterned fabrics for body cloths! Solid sofas with patterned pillows seems to have become the 'norm' and now some are branching out with the right fabric choices. Cool, calm, collected, and comfortable - you can't go wrong with that! 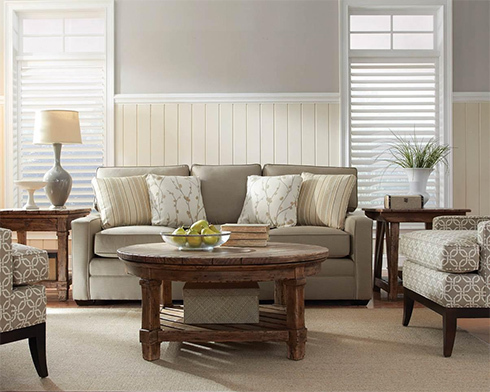 This classic slipcover sofa and chair are a comfortable look for a living room that's a little more casual. This mid-century modern influenced room brings some great geometric prints and classic detailing. Fill your living room with pieces that make sense for both your room and your lifestyle. One sofa and three chairs is a great option for conversation and entertaining. Custom select by Kincaid offers a wide range of options including arm type, base type, cushions, etc. This light filled room even features Sunbrella fabrics on the sofa and chairs to help ward of those sun rays. Now this living room furniture won't fade! 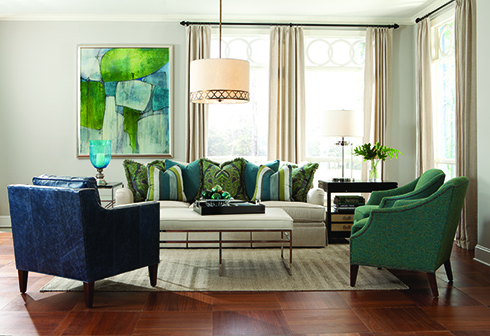 Classic style and popular designs fill HGTV Home Furniture Collection's upholstery lineup. With simple choices, you can still have a completely customized designer look in your living room. If your living room walls are painted with bold colors, try a neutral option for your sofa! Pillows and accent chairs are the perfect way to pull together the room by incorporating your wall colors. With hundreds of room settings on display in our showrooms, you'll find all of the inspiration you need at Belfort Furniture, conveniently located in Dulles, Virginia. Customer upholstery is available from a number of brands at Belfort and all fabric options are available to view in person in our showrooms.